I used to blog a fair amount about saving money, or getting by with a small grocery budget. I maybe ought to go back to that. One thing I have been doing recently is making use of digital coupons. This came about at least partly because the food pantry at our church was so short on food, so if I could pick up a couple of cans of soup cheap, that was a couple more families who would actually get a can of soup. That reminded me that I really can do well with the coupons. King Soopers -- our Kroger chain in Colorado -- recently did a 25 days of Christmas event with a whole lot of great digital coupons. Like their Free Item Friday promotion, the idea was that you have to log in on the given day and load the coupon to your card, and then you have some time to actually use it. This was the result of my most recent shopping trip. I certainly didn't use every coupon they had available, as things aren't always a good deal. But I will pick up anything that is free, and donate it to pantry if we can't use it. This shopping trip cost me $13.69, and it is all stuff I will use. Some I'll need to be a bit creative about. Like what does a family my size do with ONE Cornish Game Hen? Most everything was half off -- so the Smokies were $2.50, and the coupon download was for $1.25 off, the Cornish hen was $3.49 with a $1.75 off coupon. The shortening (which I only tend to use around this time of year) was $5.99 with a $3 off coupon. The deals where you have to log on to get the coupons tend to be a lot better than many of the regular sales. King Soopers/Kroger has a tendency to do a weekend deal as well. This weekend, you can log on to download coupons for two different items each day. I'm seriously thinking about a trip to town tomorrow, when I can get Campbell's Chunky Soup for $.75 a can, and Kettle brand chips for $.99 a bag. Not sure on the chips yet. I make it a habit to log in to both Safeway and King Soopers on Fridays to see what digital coupons they have, and what kind of weekend specials might be happening. That is one way I save on groceries. 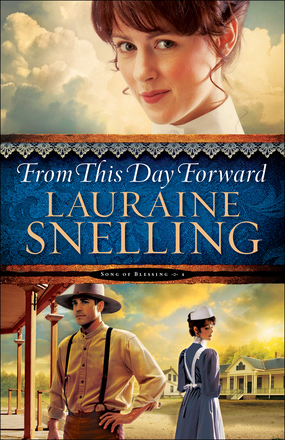 From This Day Forward by Lauraine Snelling is the fourth book in the Song of Blessing series. I have previously reviewed A Harvest of Hope (book 2) and Streams of Mercy (book 3). This book does stand alone, however, I do think it would be better if you have some experience with the characters and how they relate to one another. Picking this series up from the start would be my preference. One of the things I've loved about visiting the fictional town of Blessing, ND is that it reminds me of home. Some of the crazy and very Scandinavian names are familiar to me from the older generation living on my newspaper route, for instance. The characters seemed like younger versions of people I knew growing up. Deborah MacCallister, head nurse at the Blessing hospital, has loved Toby Valders since her school days, but she's had enough of their on-again, off-again relationship. With the help of the young women of Blessing, Deborah decides that by the end of the summer she will either have won Toby's heart--or she'll give up on him forever. Toby truly cares for Deborah, but he's never felt like he could commit to marriage or a family. When Anton Gendarme, the new schoolteacher, comes to town, sparks fly between Deborah and Anton. The sudden competition makes Toby do some serious soul-searching, but is it too late? As the town of Blessing prepares for harvest, Deborah faces the most important decision of her life. But where does her heart truly belong? That description is pretty spot-on, which is always nice. The characters in the Song of Blessing series struggle with very real issues and very real decisions, and they are written in a way that you can truly believe they are actual people with real lives. Everyone doesn't live happily ever after. Not every conflict is neatly wrapped up by the time the final credits roll. Life is a bit messy and complicated. Messy and complicated does not necessarily mean dark or depressing though. Overall, the characters are seeing the beauty of their lives and are working for better for themselves and their community. This is what keeps drawing me back to Blessing.